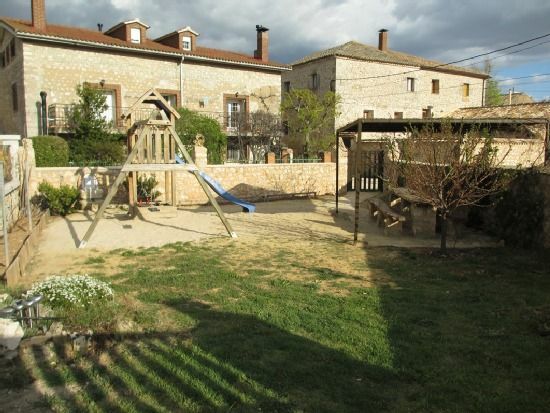 The rural house Los Trigales and el Olmo (two independent houses of 10 and 8 places, with its garden and barbecue house one) is located in Almadrones, a small town but very well connected and at the same time quiet. The town is located overlooking the source of the Badiel River, in the place known as the Carderas. You can make routes such as El Cid path through oak and holm oak forests. Also enjoy some sunsets enjoying the flowering of lavender in the month of lulio. Collection of mushrooms in autumn and spring. This river forms a very welcoming valley in which the villagers cultivate all kinds of vegetables in the gardens. People who do not know the cultivation of these products, have the opportunity to see and taste them, while enjoying a few days of the tranquility of the countryside and the comfort of the rural house. The church of the town housed before the civil war an apostolate of the Gerco, today you can enjoy a replica of these paintings. The Romanesque style stands out in its construction. - The house is divided into 3 floors, the 3rd floor being attic: - 1st floor: Living room with wood burning fireplace and garden furniture - 2nd Floor: Dining room with wood burning fireplace (can not be used), large terrace, full bathroom, a kitchen and a double room with two beds - 3rd Floor: Full bathroom and 1 double bedrooms, the other 3 with double bed, attic - The house has a cozy garden with barbecue, where you can rest in the shade of a willow - Private Children's Park, with picnic area. - All kinds of information about the surroundings, excursions, green areas to visit, towns with interest, history of the town and house, etc.. - We have another house for 8 people: 1 double and 3 double rooms, living room with fireplace and kitchen, 2 bathrooms and a large and cozy garden. with barbecue price € 320 / weekend (2 nights).